Ali was born on the 13th of Rajab in the 30th year of the Elephant (A.D. 600). Muhammad, his cousin, was now 30 years old. 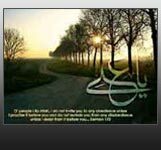 Ali's parents were Abu Talib ibn Abdul Muttalib, and Fatima, the daughter of Asad, both of the clan of Hashim. Ali was born inside the Kaaba in Mecca. This was one of the greatest distinctions that Ali enjoyed. He witnessed the rise of Islam; the Proclamation of Muhammad, and he was a witness of the Revelation of the Holy Qur'an. He immediately accepted Islam even though he was still a child, and he fought all his life for Islam. It was a custom of the Arabs that when a child was born, he was placed at the feet of the tribal idol or idols. All Arab children were dedicated to the idols except Ali ibn Abu Talib. When Ali was born, Muhammad, came into the precincts of the Kaaba to greet him. He took the infant into his arms, and dedicated him to the service of Allah. When Ali grew up, he removed idolatry and polytheism from Arabia with his sword. Another distinction that Ali enjoyed was that he never adored the idols. All Arabs worshipped idols for years and years before they rejected idolatry and accepted Islam. It is for this reason that he is called "he whose face was honoured by Allah." The birth of Ali filled the heart of the future Apostle with boundless happiness. The child was someone special for him. Muhammad had many other cousins but he didn't show any interest in any of them. When Ali was five years old, Muhammad adopted him, and from that moment they were never to part with each other. But Muhammad, the future prophet, also had another reason for adopting Ali. He picked out Ali to bring him up, to educate him, and to groom him for the great destiny that awaited him in the times to come. The Messenger of Allah himself became Ali's guide, teacher and instructor, and this is one more distinction that he enjoys, and which no one else shares with Ali. Of all the friends and companions of Muhammad, the Prophet of Islam, Ali is the only one who grew up in the full light of history. There is no part of his life, whether it is his infancy, childhood, boyhood, youth, manhood, or maturity, that is hidden from the spotlight of history. On the other hand, the rest of the companions of the Prophet come to the attention of the student of history only after they accept Islam. Ali was destined to become the right arm of Islam, and the shield of Muhammad, the Messenger of Allah. His destiny was inseparably linked with the destiny of Islam, and the life of its Prophet. He reflected the image of Muhammad. In the years to come, the creative synergy of Muhammad and Ali – the master and the disciple – was going to place the Kingdom of Heaven on the map of the world.